Includes core-technology ,which is independently designed and manufactured by Newland Auto-ID. technology includes the optical, CMOS,digitizer, decoder, image processing & embedded systems. Through a 1D or 2D scan engine as well as an RFID engine. Transmit data through Ethernet, WiFi or Bluetooth. 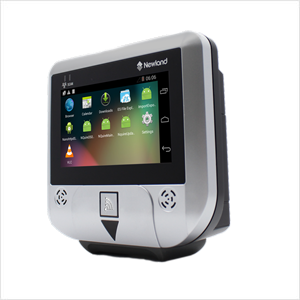 The external USB and GPIO ports enablethe possibilities to attach a Newland handheld scanner for controlling anentry/exit gate or door lock. Designer and ergonomic Information Terminal which can beused as a price verifier/checker, access control terminal ormulti-media commercial player. Because of its small size and the VESA 75 mountability, itcan be installed virtually anywhere in a store or office. 1D: EAN-13, EAN-8, UCC/EAN-128, UPC-A, UPC-E, ISBN, Codabar, Code 128, Code 93, ITF-6, ITF-14, Interleaved 2 of 5, Industrial 2 of 5, Standard 2 of 5, Matrix 2 of 5, GS1 Databar, Code 39, Code 32, Code 11, MSI-Plessey, Plessey. The NQuire 300 complies with standard VESA 75 bracket, enabling easy mounting on shelves and walls.